Do you guys like mashups as much as I do?? I could spend all day on Pinterest checking out all the mashed up things. 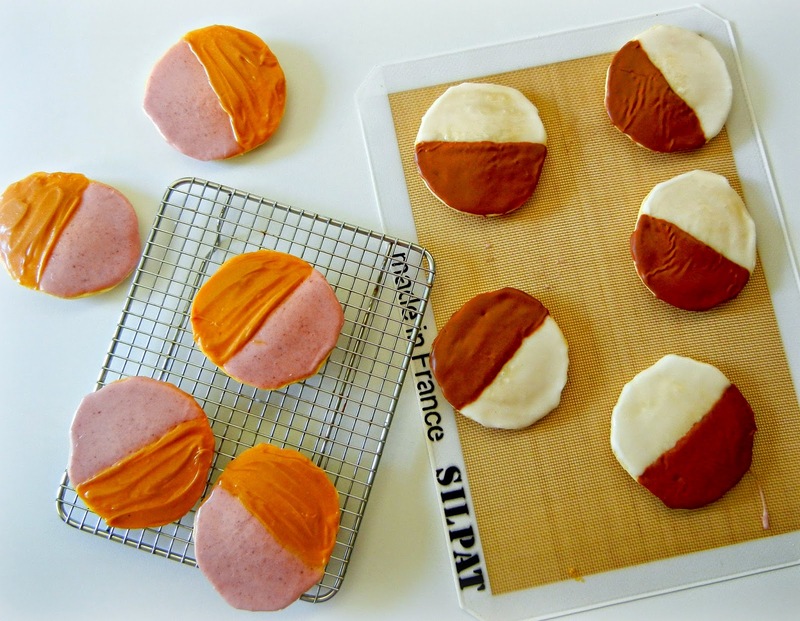 So I made mashup cookies. 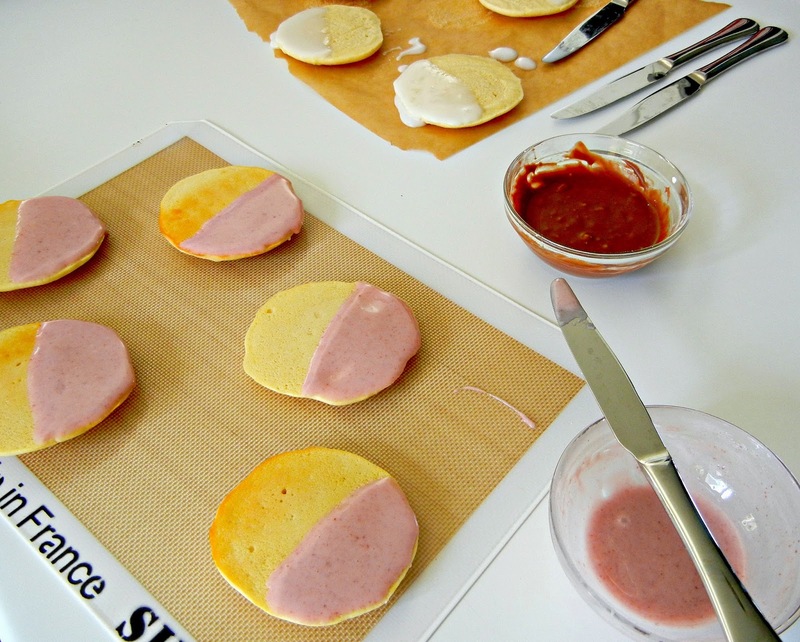 Peanut Butter and Jelly + Black and White Cookies aka Half n' Half Cookies. If you read the blog at all, you may know my kiddos have peanut and tree nut allergies. Well 2 out of 3 have allergies so we've really avoided nut treats around here. Fortunately, my 2 kids are not so allergic that they can't be near peanut butter or have stuff manufactured in a facility that handles nuts. Since 2 kids are allergic, we almost treat the 3rd like he's allergic too - it was always way easier that way, but recently he's been asking to try peanut stuff and surprise - we found out he does like peanut butter and jelly sandwiches. 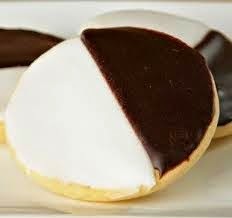 The kids also love Black and White Cookies - the popular cookies in NYC (which is only about 30 mins from our house so these cookies are available everywhere around us). And if you've never had Black and Whites, immediately go buy some or better yet make them. They are part cake/part cookie with chocolate and vanilla icing on top. Seriously good stuff so I thought I'd make them some homemade Black and Whites but also make the un-allergic kid a PB and J version. 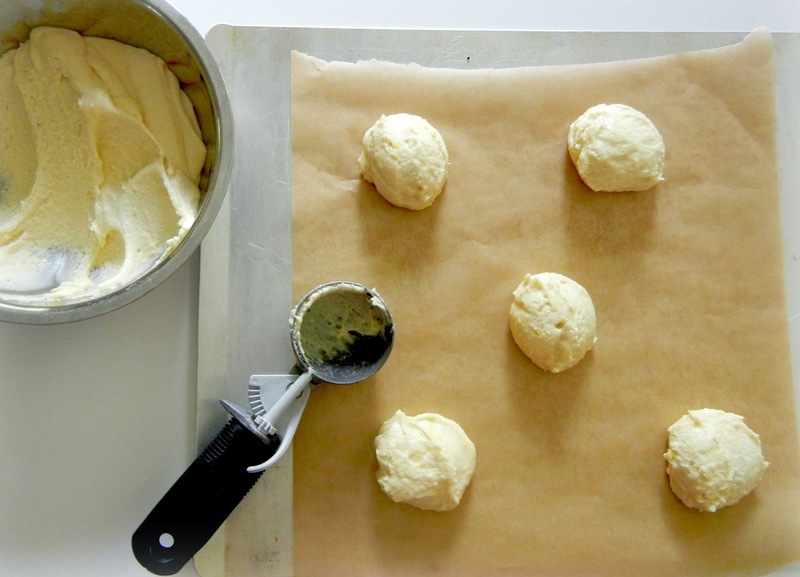 I used this cookie recipe from Martha Stewart Living - which was really simple to make. The base cookie is the same for each version. 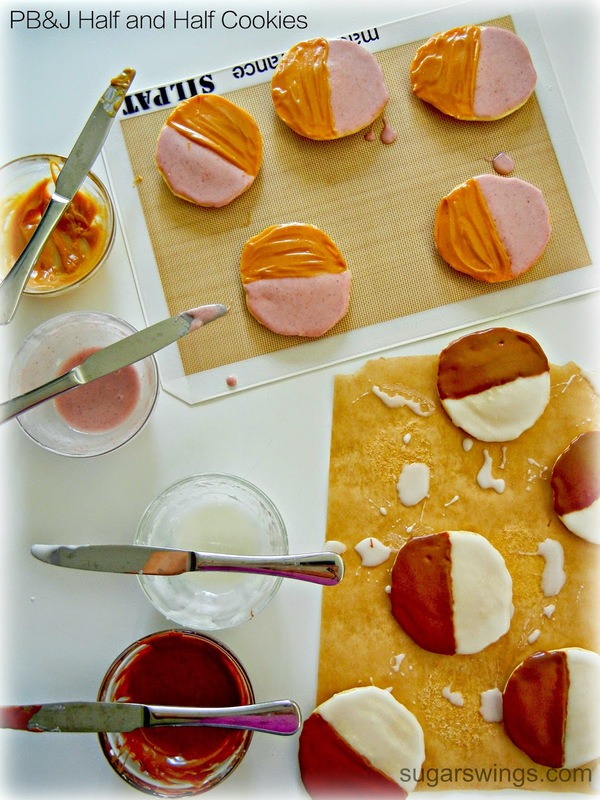 Once cookies are cooled, spread 1/2 with the grape jelly icing and 1/2 with the peanut butter icing and/or 1/2 with the white icing and 1/2 with chocolate icing. Ice the flat side of the cookie. A note about icing consistency, it should be thick enough to stay on the cookie without dripping off (see the white icing pic above? That's too runny and needs to be thicker - add more confectioners sugar if that happens!). The icing should also be nicely spreadable without lines (see the peanut butter side on pic below? That's too thick. Add a 1/2 teaspoonful of water or corn syrup if that happens!). Cookie base recipe can be found here. Add 1 tablespoonful of light corn syrup to each bowl. Mix well. Add peanut butter to one bowl, jelly to a bowl, and melted chocolate to 3rd bowl. Mix well. Add more confectioners sugar as needed until icing spreads without being too runny. Add water by 1/2 teaspoonfuls if the icing is too thick. Ice each half of a cookie with the icings. Allow to sit out until icings are hard to the touch. 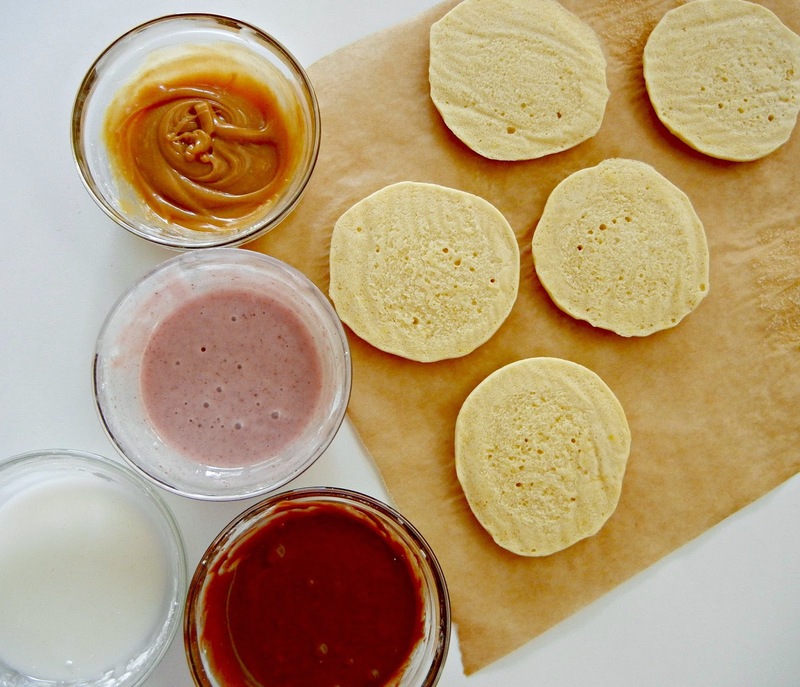 If you like peanut butter and jelly sammiches, you'll love these PB and J Half n' Half cookies. Eat one with a glass of milk and your'e good to go. And if you have nut allergies like my other 2 kids, make the traditional Black and White ones (also a big hit) or you could use soy nut butter too in place of peanut butter!). Hope you like them! 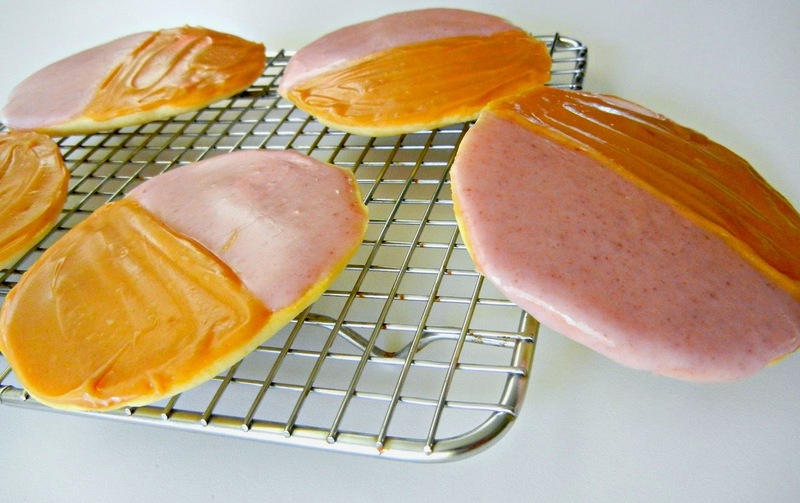 And speaking of mashups, check out my bloggy friend Dorothy aka Crazy for Crust. 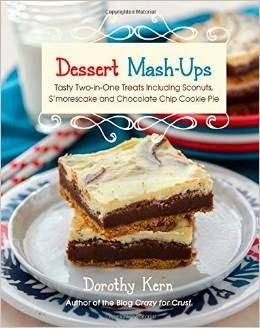 Her new book, Dessert Mash-Ups, just dropped and its totally up my alley. I think I HAVE to make the sconuts or strawberry pie cupcakes! Check it out here on Amazon!